I am measuring on Neutral, after the engine warmed up. At idle (about 700 RPM) my LTFT is steady at 31% and my STFT is between 4-6%. At 2,500 RPM, both FTs drop but seem to be doing opposite things: LTFT goes to 22% (remains positive) and STFT drops to -4% - 0% (becomes negative). Going up to 3,200 RPM, the 2 FT are going in opposite directions: LTFT goes back up to 31% and STFT drops to -20%. 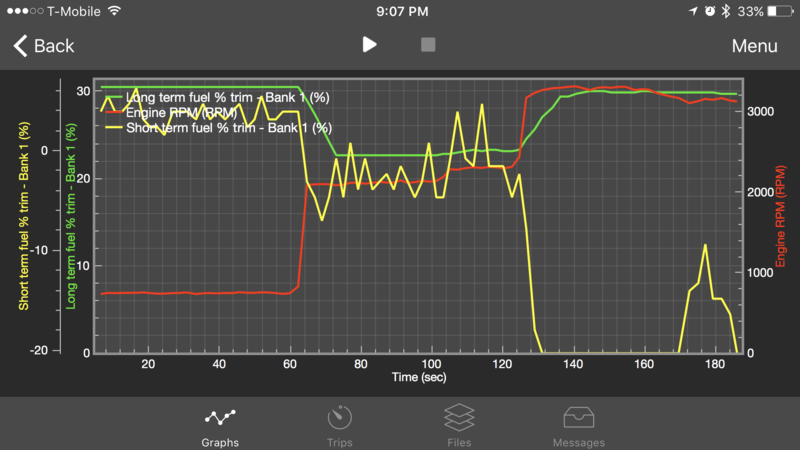 I am not understanding why ST and LT seem to be competing (adding / removing fuel), and also why they are going in opposite directions at higher RPM. If somebody could help, or tell me what to test next it would be really helpful! Great question, you supplied enough data to give direction and this is a common problem. This pattern of fuel trim behavior, higher positive at idle than at cruise speeds, is commonly seen when the mass air flow sensor gets dirty. Inspect with a strong light and a minimum of 3x magnification. Look down the small rectangular hole and see if the two small sensors elements are covered with oil and fuzzy looking dirt. If the outside of the MAF sensor appears oily then it should be replaced. This shiny stuff is actually the potting material from inside the sensor leaking out. Carefully cleaning the elements with an purpose made solvent can help but if the potting material is leaking out it will return. The variation in fuel trim as rpm changes are normal and has no particular significance. The overall trends are what matter. It is best seen by graphing total fuel trim. The ST being negative at the same as the LT trim being positive just means that this load cell has not adjusted to the new mixture condition. To evaluate the actual trim numbers that the PCM is using add the ST to the LT which results in the total fuel trim. There are many other possible causes of higher than normal fuel trims. But the MAF would be my first test. If the MAF turns out to be OK then test for intake leaks, low fuel pressure, bad air fuel ratio sensor or restricted fuel injectors. Not the answer you're looking for? Browse other questions tagged p0171 fuel-trims or ask your own question. What exactly are fuel trims? P0171: what to look at next, after MAF, O2 senors, fuel filter, and vacuum?